Relaxed, waterfront casual dining at an affordable price, all week long. Yachties is our Club bistro, offering a range of meals and light snacks in a more relaxed, casual setting. Perfect for a mid-week meal for the whole family or a meal with friends on the weekend. 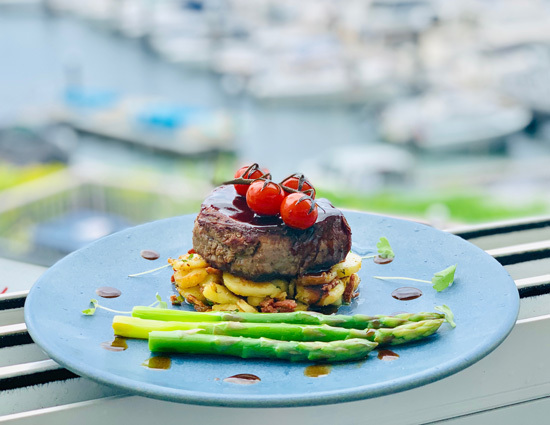 Open seven days a week for lunch and dinner, Yachties is the perfect place to enjoy a casual meal while taking in the view, enjoying some live music or watching a sporting game on the big screen. With sweeping, unrestricted, spectacular views of the Port Hacking River & Gunnamatta Bay from every table, our unique waterfront location provides an ideal setting for your next meal or occasion. Book ahead with our online reservation system. We look forward to having you at the RMYC Port Hacking. Looking for something more intimate? RMYC Port Hacking also offers group bookings for small celebrations and intimate events. Think about your choices. Call Gambling Help 1800 858 858 or visit the website gamblinhelp.nsw.gov.au.